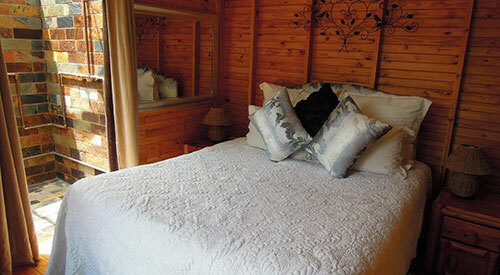 Nullarbor Cottages comprises ten Self Catering Cottages seven of which have corner Jacuzzi spa baths, two with shower only and one with Victorian Ball and Claw Bath. 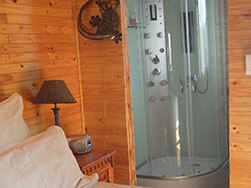 All have shower facilities - indoors or outside. 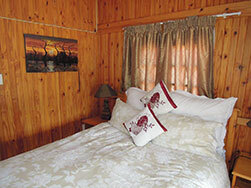 This economy wooden cottage is tucked away at the top end of the property and is a very private and secluded unit. A sliding door leads onto the small patio facing the mountains from the bedroom and the second sliding door leads out from the lounge to patio overlooking the first swimming pool. 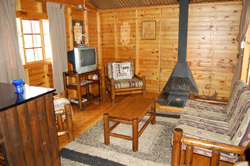 Lounge/Dining Room with dining table with two chairs, comfortable 3-seater sleeper couch and open log fireplace. Bedroom: Extra length queen size bed with side tables and reading lights. Bathroom: En-suite Shower with Toilet with Basin. 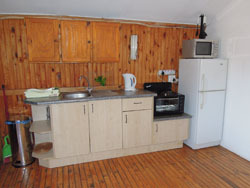 Kitchen – a small well-equipped kitchen accessed from the lounge. 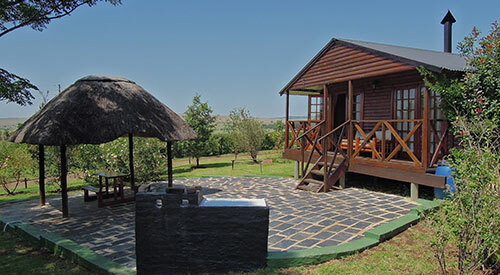 Outdoor braai area: A very large thatch Lapa with wooden bench adjacent to the braai area is ideal for relaxing outside on sunny days. 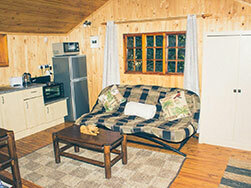 This cottage individually fenced (1.2metres high) and gated to give you and your dogs a private space. Suitable for large or small well-behaved pets but not suitable for pets that cannot be contained in the gardens. 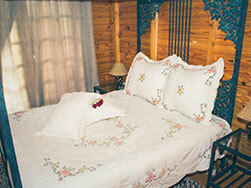 Wooden cottage situated close to the main entrance gate and very close to the swimming pool. Kitchen: The small well equipped kitchen adjacent to the lounge. Bedroom: Leading off from the lounge, the bedroom has a Queen size bed with bedside tables and reading lamps. A cottage-pane glass sliding door leads out onto the braai and patio, making it a bright, sunny and airy room. 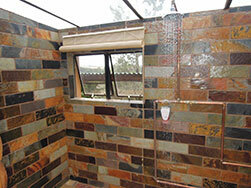 Shower: Large en-suite walk-in shower with dual shower-heads and separate water controls. A glass roof allows you to enjoy the sky, sunlight and stars above without subjecting you to the elements while you shower. 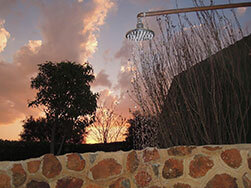 Outdoor Shower: With hot and cold water to shower under the stars. Bathroom: Separate en-suite bathroom with Victorian Ball & Claw bath. 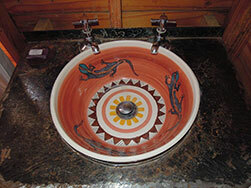 Toilet and Hand Basin. Sun Room: Enclosed area north facing room with glass sliding door leading to braai area. 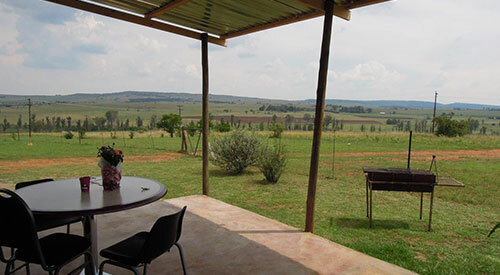 Outdoor braai area: Two doors lead out onto the braai area with small thatched Lapa and bench. Private area with shady trees. Wooden cottage with magnificent views of gardens and mountains. Covered front patio with two double doors leading out from the dining room and bedroom. 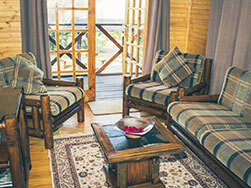 Lounge: The lounge has two-seater couch with indoor fireplace, Coffee table and eating counter with two barstools. Large screen TV with DSTV. Bedroom: Queen size bed with bedside tables and lights Uniquely designed hand basin in the bedroom. 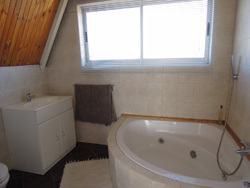 Bathroom: Leading off from the lounge/kitchen is a separate bathroom with corner bath, hand-shower and toilet. Kitchen: The well-equipped kitchen is part of the lounge. Outdoor area: A large thatch Lapa and wooden bench. 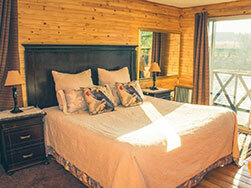 Views of mountains and tree tops with an abundance of birds to wake you up in a very different manner. Beautiful outdoor shower built from natural rock with aluminium door situated next to the braai area and hidden in the dense foliage. Bedroom: Queen size bed with bedside tables and lights Uniquely designed hand basin in the bedroom.. 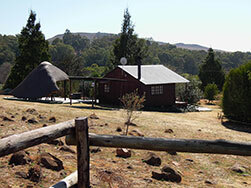 Outdoor braai area: A large thatch Lapa and wooden bench. Lovely views of mountains and tree tops. Beautiful private and secluded outdoor shower built from natural rock with aluminium door situated next to the braai area to shower under the stars. 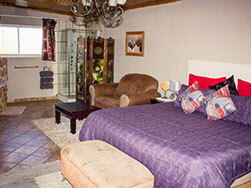 Pula is a very large bedsitter situated at the top of the property and affords complete privacy with uninterrupted views across the mountain. Very large north facing glass sliding doors brings the countryside right into your home. A large combined lounge, bedroom and kitchen. 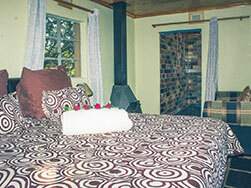 Queen size bed and open fireplace. With a comfortable couch to watch the TV and enjoy the fireplace. The well-equipped kitchen is part of the lounge. 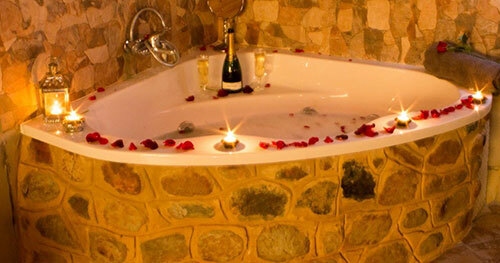 Shower: The shower is separate from the bathroom and is en-suite to the bedroom. 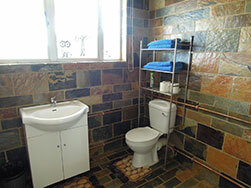 Bathroom: En-suite bathroom with corner bath, hand-shower, basin and toilet. Kitchen: The well-equipped kitchen is part of the lounge. Three plate electric stove/oven, Microwave, Fridge with freezer and all cooking and eating utensils. Serving dishes, glasses and ice-bucket. Dish wash liquid and dishtowels. 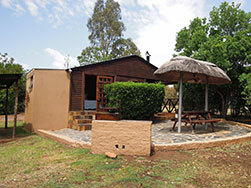 Outdoor area: Veranda leads onto the paved patio area with large thatch Lapa and private braai. 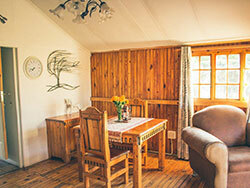 One of the most private, airy and tranquil cottages on the farm. 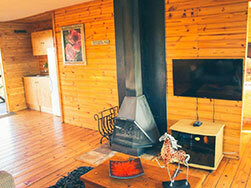 This cottage individually fenced (1.2metres high) and gated to give you and your dogs a private space. Suitable for large or small well-behaved pets but not suitable for pets that cannot be contained in the gardens. 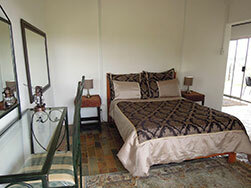 A very private and secluded Luxury brick cottage with queen size bed for two adults sharing. Ensuite bathroom with shower and outdoor shower. Separate lounge and kitchen. Sliding doors to patio/braai area. TV & DSTV. Fireplace. Very airy and open with magnificent views. This cottage individually fenced (1.2metres high) and gated to give you and your dogs a private space. Suitable for large or small well behaved pets but not suitable for pets that cannot be contained in the gardens. 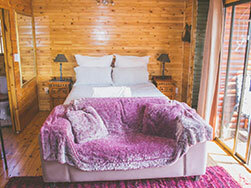 A large luxury cottage originally built from wood. A brick extension has been built created a bright and airy unit. Three doors lead out onto the Lapa and braai area. One from the dining room, the second from the bedroom and the third from the shower. 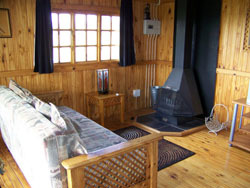 Bedroom: There is an open log fireplace in the bedroom with a two-seater couch in front of the fireplace. Shower: Leading off from the bedroom is a large walk-in shower with dual shower-heads and separate water controls. A skylight lets the fresh air in and proves star-gazing while you shower. There is a glass sliding door leading onto the patio and braai area. Bathroom: Accessed from the lounge/kitchen is a separate bathroom with corner jet bath with 6 jets. Toilet and Hand Basin. 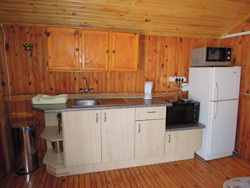 Kitchen: The kitchen is small and well-equipped. Outdoor braai area: Lapa with round glass table and two chairs. 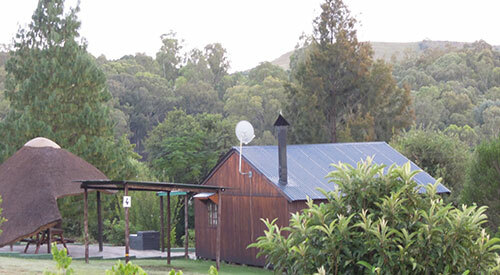 Braai with views of the swimming pool and distant mountains making this a very special cottage. 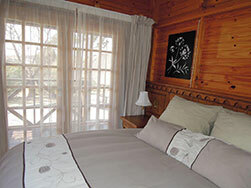 A large, luxury cottage with sunny patio, this unit overlooks a pool and has a glass sliding door leading from the bedroom with views of gardens and mountains making it an airy and welcoming cottage in summer and a warm and comfortable one in winter. Lounge: The lounge built from wood and has a double couch and large puffy couch directly in front of the fireplace with separate comfortable chair. There is a small wooden dining room table with two chairs. Kitchen: The small well-equipped kitchen is part of the lounge. 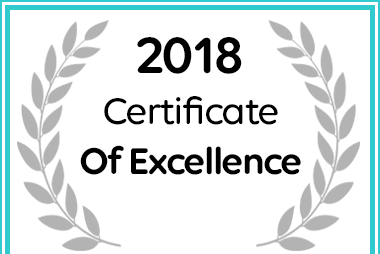 Bedroom/Bath/Shower: There is a very large brick bedroom with King Size bed and corner jet bath with 6 jets and separate shower in the bedroom. 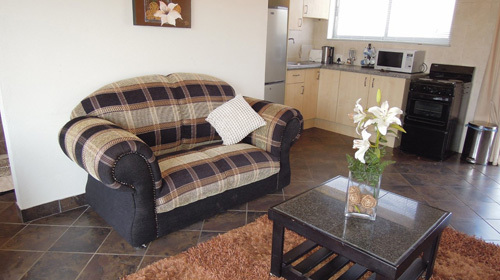 The Large screen TV with DSTV and a couch. Toilet: Leading off from the lounge/kitchen is a separate toilet with Hand Basin. 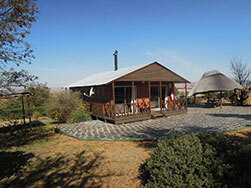 Outdoor braai area: Large thatch Lapa with wooden bench and braai. 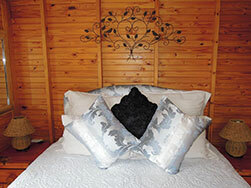 A beautifully appointed and spacious wooden cottage which has both front and back patios. The bedroom and lounge both have large glass sliding doors leading out to the front patio. This unit is also one of the most private being tucked away at the top of the farm with great views from both front and back entrances. Lounge/dining area. The lounge has two, two seater couches. Indoor fireplace, coffee table and large screen TV. Dining room table with four chairs. Kitchen: The well-equipped kitchen is part of the lounge/dining area. Bedroom: King size bed with bedside tables and dressing table. Bathroom: En-suite bathroom with corner jet bath with 6 jets, hand-shower. Toilet and hand basin. 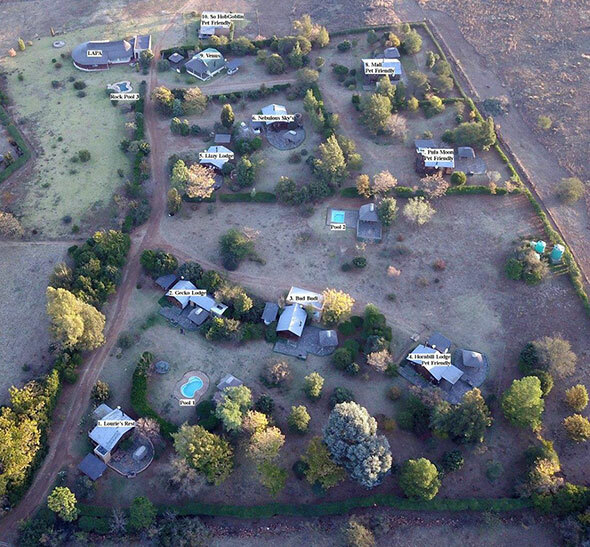 Outdoor braai area: Large paved area with thatch Lapa and wooden bench. Private braai with very special views of mountains Beautiful outdoor shower built from natural rock with aluminium door situated next to the braai area with unbelievable views. 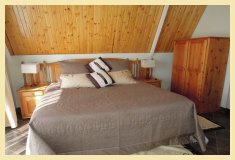 Beautifully appointed and spacious A-Frame brick cottage with large shady thatched patio overlooking the rock swimming pool and the mountains in the distance. Glass sliding doors lead out onto the front patio - one from the dining room, the second from the bedroom. Lounge/dining area has a two-seater couch and comfortable chair. 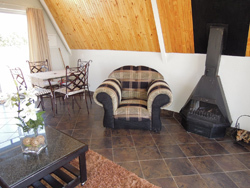 Indoor fireplace, coffee table and large screen TV with DSTV. Dining room table with four chairs. Kitchen: The well-equipped kitchen is part of the lounge/dining area. The back glass sliding door leads onto rear patio. Bedroom: King size bed with bedside tables, lights and a dressing table. 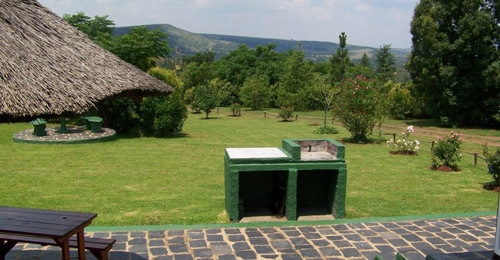 Outdoor braai area: Separate thatch Lapa and wooden bench adjacent to the braai. Beautiful outdoor shower built from natural rock situated next to the braai area overlooking the Witwatersrand Mountains and valley.